The meeting & merging of masculine and feminine is a primary objective of Tantric practice. In human evolution, the year 2012 signals the time when the inner marriage between masculine & feminine becomes more available to us – and the imperative is strong for us to use the opportunity. When masculine and feminine merge, we awake to the truth of who we really are – the Beloved as such. On the way there, it is important for Man to open to fully embodying the Masculine, and for Woman to embody the Feminine. Once this has happened, we can open to the other, and start dancing with the Soulmate Within. The feminine, as represented in Tantra by Shakti, is not afraid of the dark underworld. She creates the world of illusions. She is comfortable exploring & integrating what is in the unconscious. She explores dark eros & finds the gifts in those corners of existence that have been shunned. She smells, drinks, feels, hears, tastes. She receives the mystery & opens to that which is beyond the known. The masculine, as represented in Tantra by Shiva, holds one pointed focus and stillness. Shiva sits in deep meditation on Mount Khailash, and is undisturbed by the movement of the elements around him. His quality is presence, and when he acts, he does so with skillful means. His attitude to the feminine is total love and devotion. He is the arrow that enters where the feminine guides and takes the energy upward towards transcendent oneness with all that is. Exploring both unconscious and conscious aspects of our sexuality. This workshop is suitable for all sincere seekers of truth of any gender or orientation, single or partnered. You do not need a partner to attend. This workshop is for all who are willing to commit to a Tantric journey of deep transformation. Transformation here means that your cherished concepts about love may be brought to into question, and old energy structures that no longer serve you may fall away. For the ego, this can feel like death or extreme disruption. Mostly however, the shifts feel much more gracious and subtle. 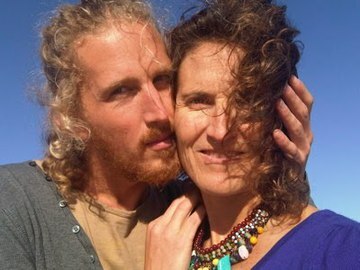 You will have an opportunity on this workshop to explore the dance of Man and Woman Awakening with two facilitators who have been exploring and living these qualities deeply in their personal Tantric practice. Shakti’s purpose as Tantric dakini is to facilitate your awakening to the essence of who you really are, while remaining fully functional in your body. Many traditions of enlightenment view the body as that which is to be transcended. Tantra sees the body as a vehicle for awakening. The process of dropping through veils of illusion can be very impactful on our nervous system, and every aspect of our physical and energetic bodies. Because Shakti values the body as the vehicle through which you can share your awakening with the world, she aims to ensure that your energetic and physical bodies are fully prepared for the process of waking up. This requires totality of the seeker – the willingness to have every aspect of your energetic and physical reality be purified by the power of truth. As this happens, conversely, the body becomes capable of sensing and experiencing on increasingly subtle and refined levels. Thus, the physical vessel of the body becomes a suitable instrument to transmit the essence of the awakened state. Shakti has a Ph.D. in Social Anthropology, a discipline that teaches the practitioner to listen to the reality of groups and individuals from an insider perspective, through immersion in the texture of their lives. She spent many years translating the realities of vulnerable communities to decision makers in government, development organizations and corporates in the fields of poverty management, economic development and environmental management. Shakti’s training as dakini comes through the Advaita tradition and many years of immersion in meditation and conscious body practices. From his early twenties, Aaron’s life has been immersed in the study of Tantra and meditation. He has worked with the Tantric teachings of Bernie Prior, Barry Long, Saniel Bonder and David Deida, as well as Ipsalu Tantra, the intimacy practices of the Realization Process created by Judith Blackstone and the Womb Wisdom work of Padma Aon, exploring specifically these aspects of Tantric practice: Resting in Non Dual stillness, being present as Awareness fully in the body, conducting energy or Shakti throughout the body, and opening the heart and body fully to the mystery of Woman. Aaron’s exploration of consciousness and meditation practices has been through the work of masters such as Anadi, Adyashanti, John DeRuiter and Leslie Temple Thurston, through whose work he has discovered the ever deepening awakening of Pure Awareness beyond Form and its continuing clarification and evolution in the marriage of Spirit and Form within the Non Dual Ground of Being. This workshop has received rave reviews in London when it was held there and there are already people planning to travel up from England because they want to attend a second time or because they couldn’t go to the London workshop.